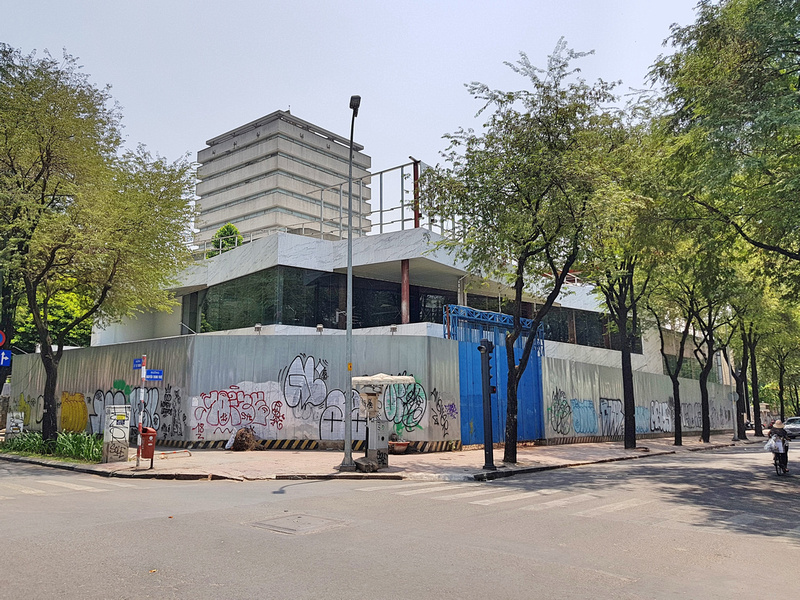 With so many construction projects underway in Saigon (alongside many stalled projects), there are also many projects that never were. In the process of researching current and future construction projects, I unearthed some interesting (and some horrifying) projects that were never built. 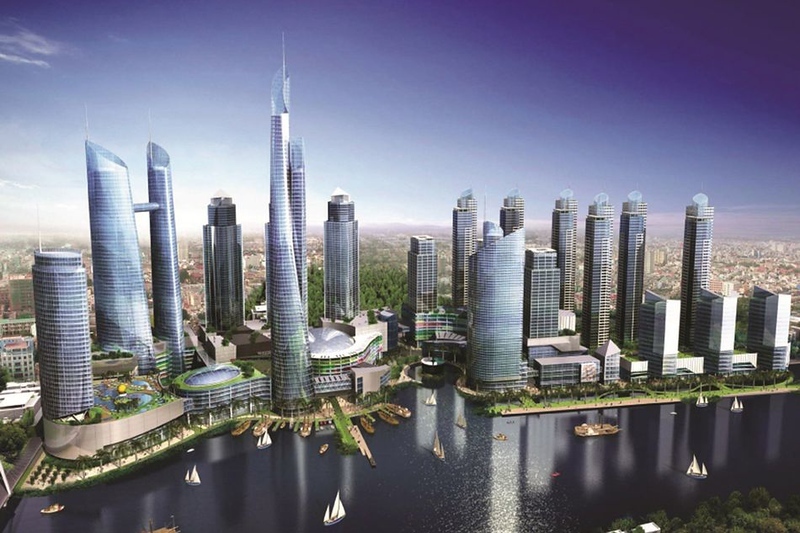 This list contains some of the most notable unbuilt buildings of Ho Chi Minh City. These include alternative designs for buildings that were built, and projects that literally and figuratively never got off the ground. Some of the these are missed opportunities, and some are dodged bullets. 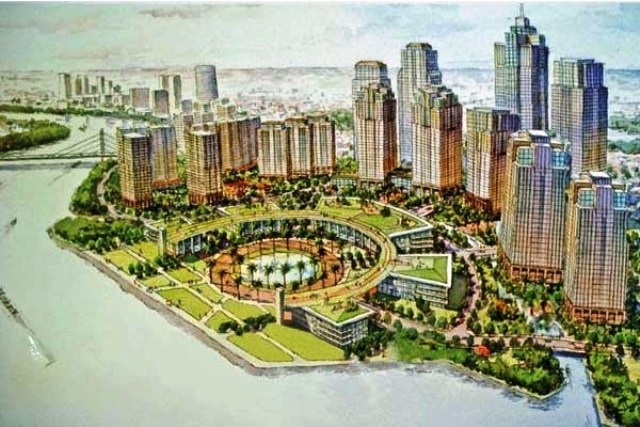 Either way, this is a glimpse of what the cityscape could have looked like. I’ll be continually updating this list, so send in more suggestions. Address: 1 Pham Ngu Lau, Ben Thanh Market, District 1, HCMC. 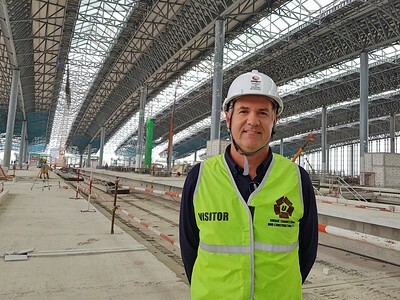 The Spirit of Saigon (previously known as The One Ho Chi Minh City) is opposite what will become the central station of the metro network at Ben Thanh Market. As one of the most prominent blocks of land in the city, this site needs a distinctive building in its place. 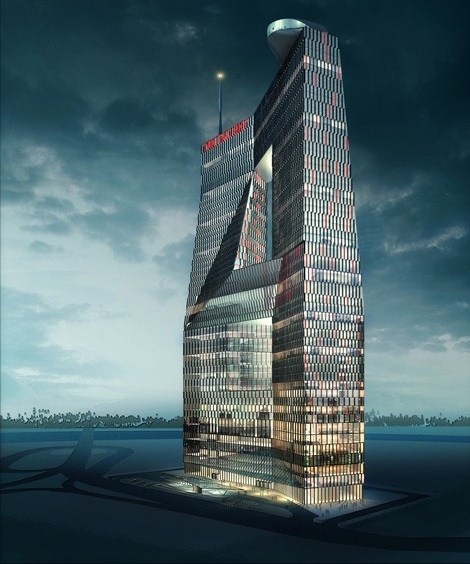 One previous design had golden twin towers on a podium. Ben Thanh Rectangular by htt-group.com came second in a design competition in 2007. 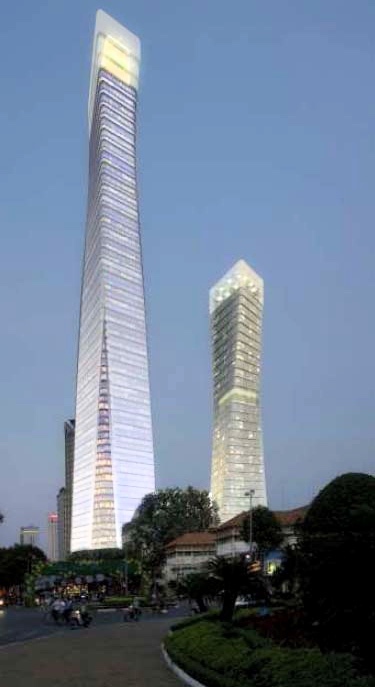 The current design is of two towers that represent dragons, and it’s supposed to look like this. It’s currently stalled with no news of when it will restart, so this might end up as a never built as well. 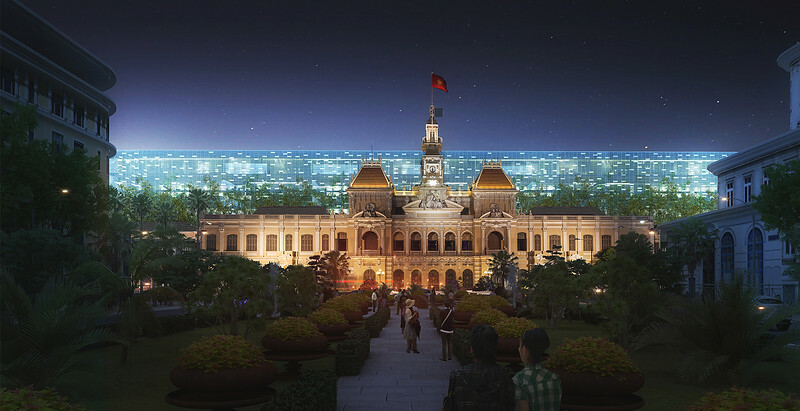 Even before the Saigon Tax Trade Centre was demolished in 2016, there have been alternative visions for what would occupy the site. 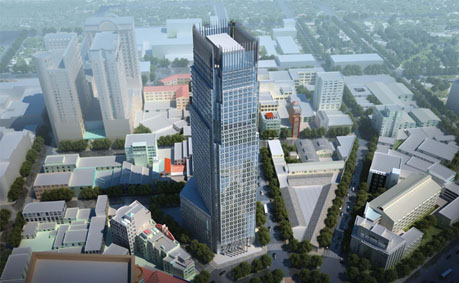 The original proposal had a 62 storey tower on top of a mixed retail and conference space. This version was posted in 2011. 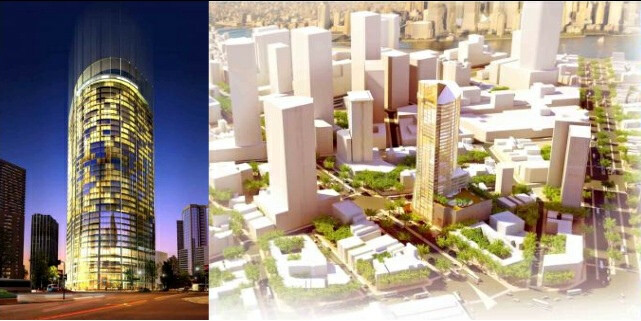 Here is a twin tower proposal. And another twin tower design that never made the cut. 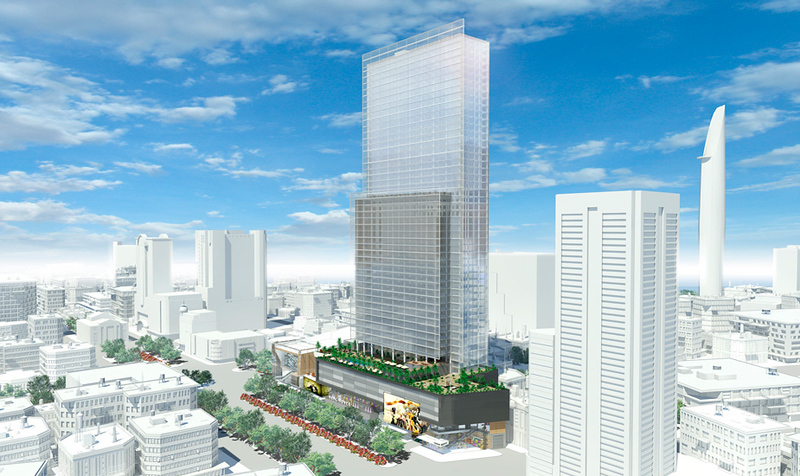 The latest design is a 5-star hotel from Japan on top of a retail podium. It’s still being advertised as opening in 2020 even though no work has commenced since the site was cleared. After two years of no updates will this be added to the never built list? 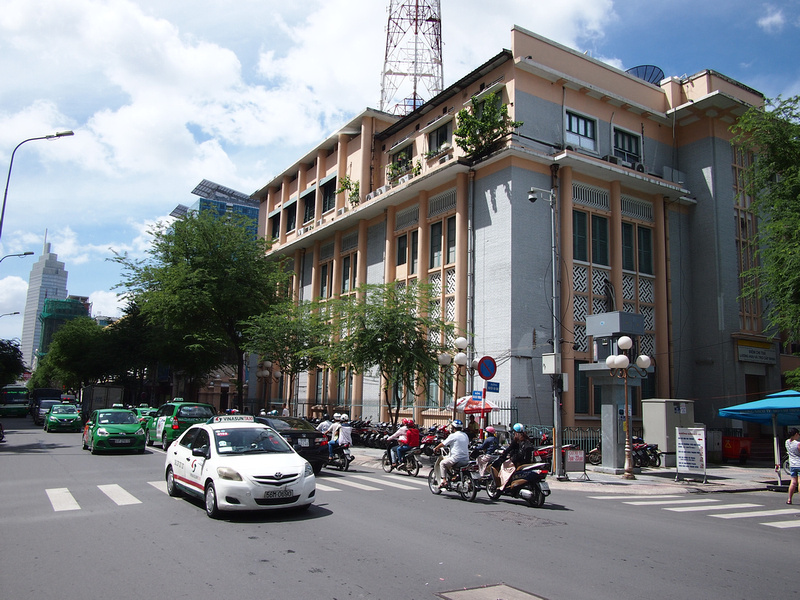 Address: Corner Le Loi and Nam Ky Khoi Nghia, District 1, HCMC. This proposal is has been around since at least 2006, situated on a prime block of land that was cleared in the 1990’s. 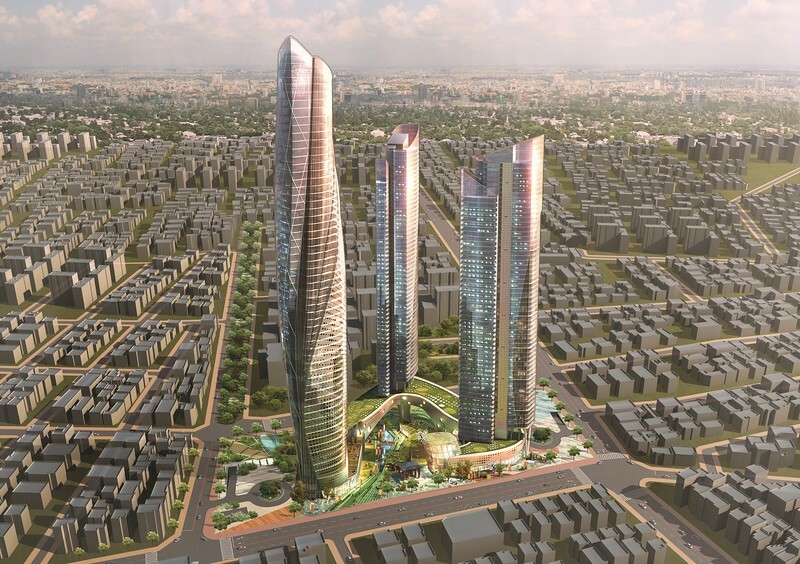 Different designs and heights have been proposed over the years, and it has been planned as an office and 5-star hotel. This has been around for so long that I’ll leave it in “never built” until it’s revived. It will most likely be an updated design anyway, so these plans will remain as never built even when the project does get going. 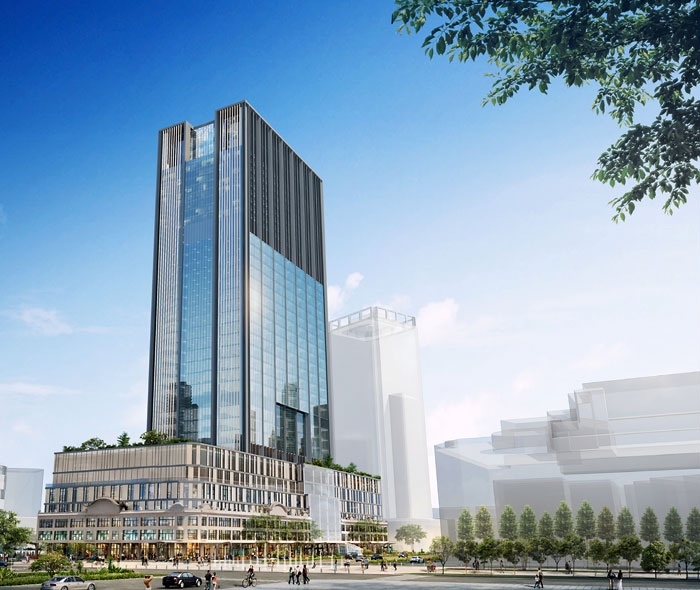 The site is opposite the Saigon Centre where the current Saigon Square shopping market is. Address: 65 Le Loi, District 1, HCMC. 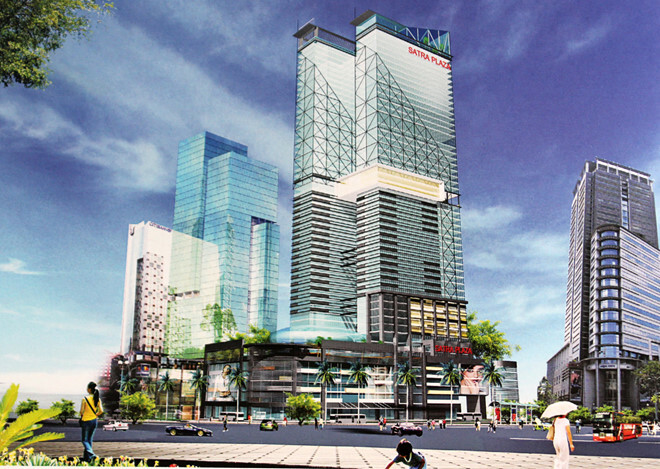 This version of Saigon Centre Phase 2 appeared in 2008, with construction to begin in 2009. The final version is a more traditional glass box that was completed in 2017, albeit a version with more practical floor space. 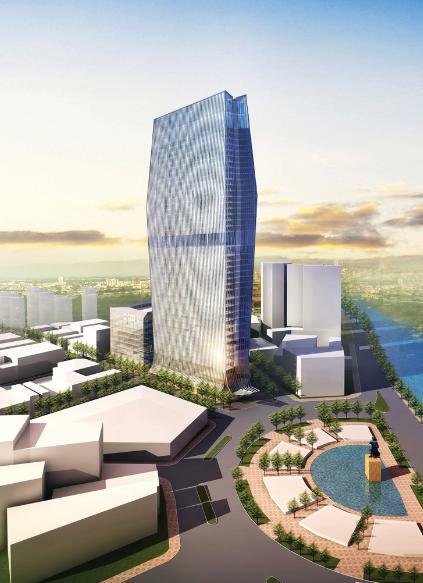 The Saigon Financial Center was proposed on the site of the Saigon General Hospital at Ben Thanh market. There was also a design for a hotel on the same location. While these plans will remain as never built, it’s likely that the hospital will be moved and the site redeveloped at some point. Address: 5 Cong Truong Me Linh, District 1. 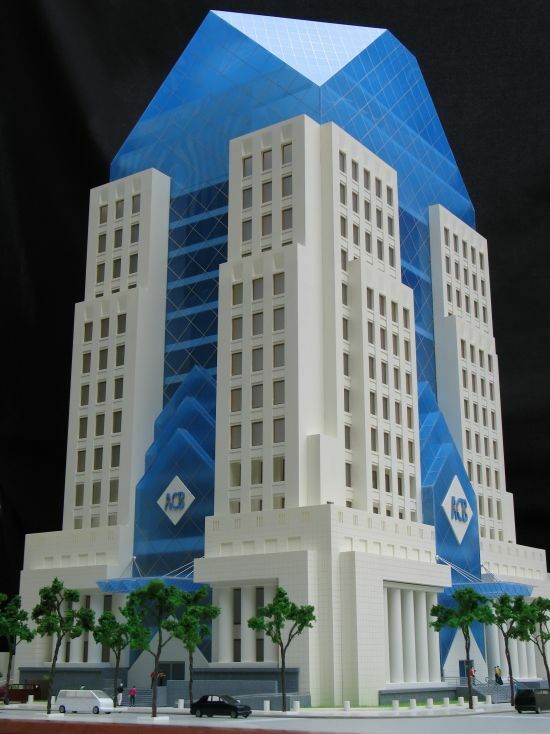 The Vietcombank Tower has been completed, but here are some previous versions that are different to the final product. The Ba Son redevelopment has been on the drawing board for years, and while trawling through old news archives I found different models to the one that was finally settled on. 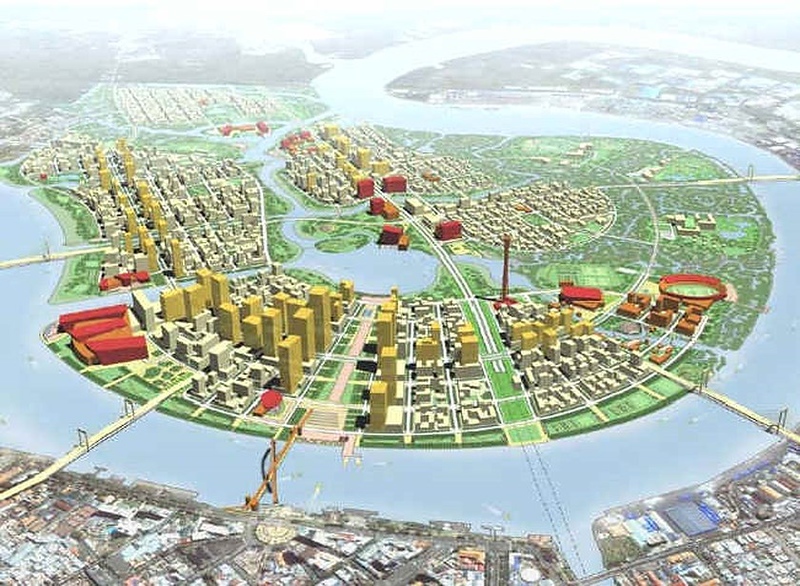 In 2007 this plan named Ba Son City 21 showed an illustration of what the project might look like. 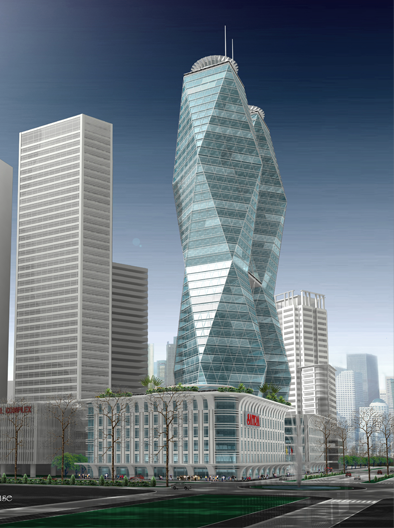 This one shows what looks like to be a gherkin-inspired tower. 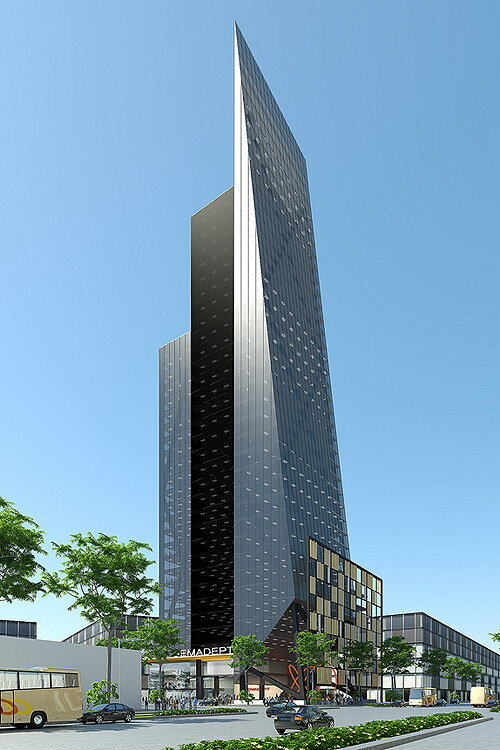 Here is another one that shows a more prominent feature tower. Since the project began, ownership of some sections has changed hands and the plan has been revised. 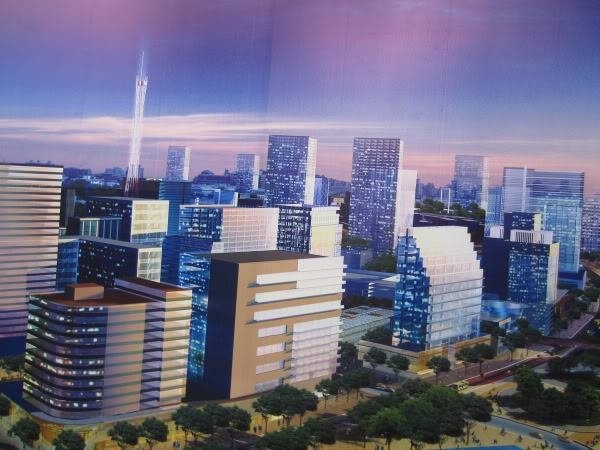 This is the latest render I could find, with the five towers on the right being completed. Even if the rest of towers are built exactly as shown I will leave this image for the awesome mountainous background that has been added to the Saigon skyline. 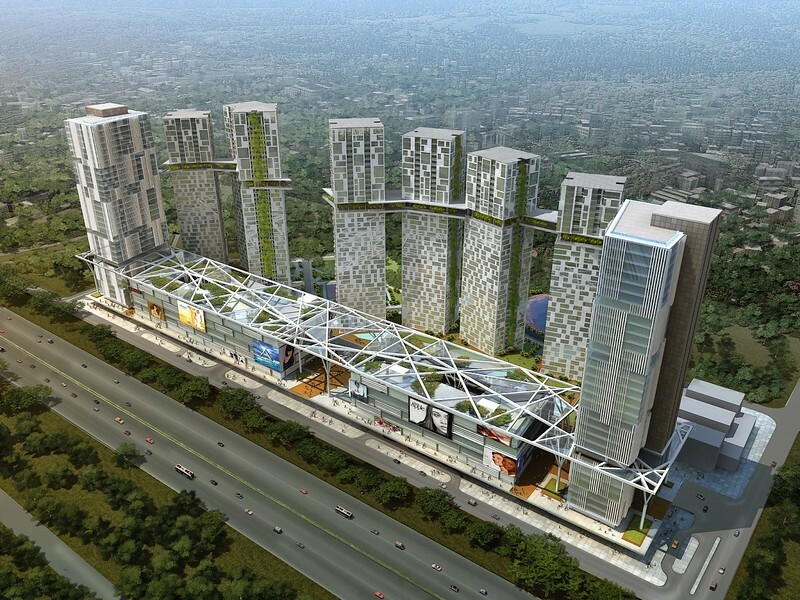 The Eden Center by DCM Studios was an alternative vision for the replacement of the Eden Centre (or Eden Mall). According to the developers websites, this would have involved retaining some of heritage structures and “stitching” them to the building. In the end the Union Square building was built here. 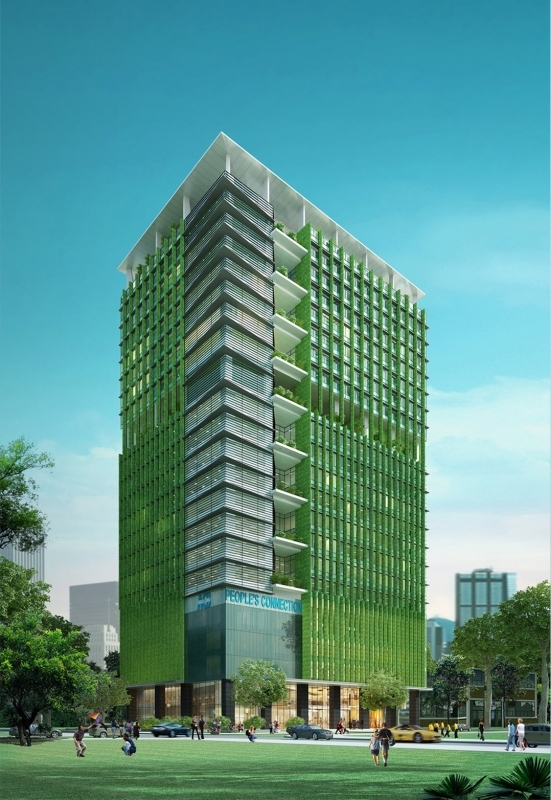 Address: 159 Ha Noi Highway, Thao Dien, District 2, HCMC. 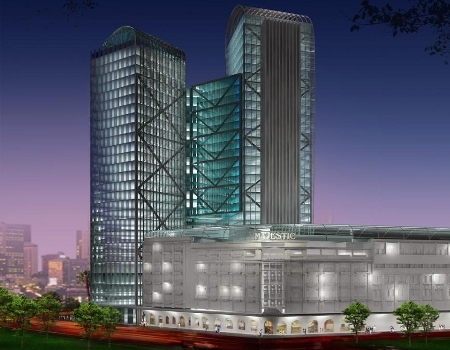 The Vincom Mega Mall Thao Dien has already been completed, but it’s a different beast to the one that was first offered. 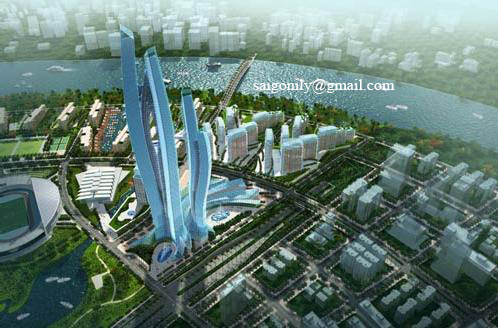 The original image shows a sleek and curvy glass structure that is integrated into the future An Phu metro station. The actual finished building is a boxier number that resembles a cheap fabricated mega mall in suburban USA. 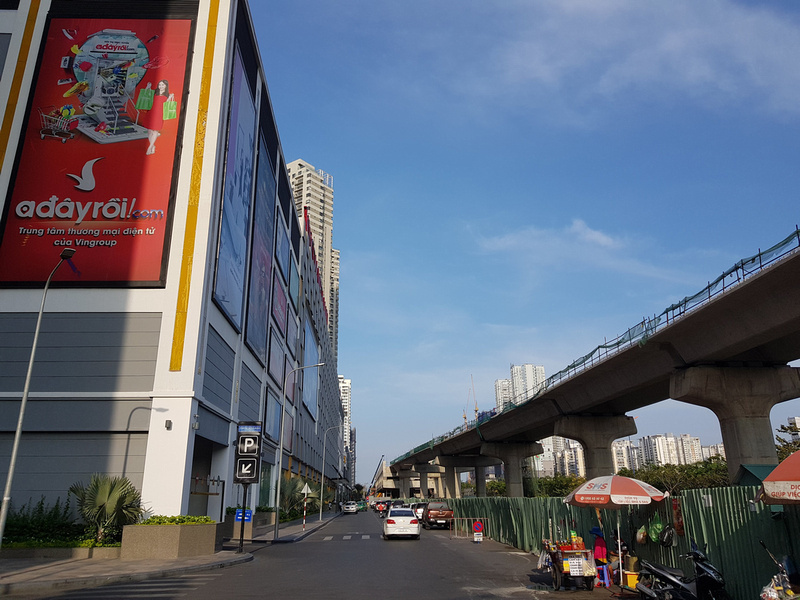 There is no indication to how the mall will connect to the metro either. 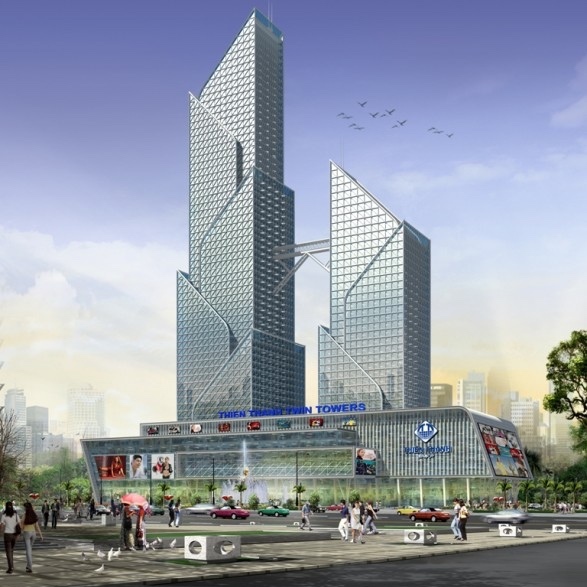 Preceding the Vincom Mega Mall plan was this plan for Metropolis Thao Dien, which included a mall bookended by two different towers. Behind this is a group of towers that would have been joined with skybridges. This is now Masteri Thao Dien. Address: Corner Nguyen Hue and Ton Duc Thang, District 1, HCMC. 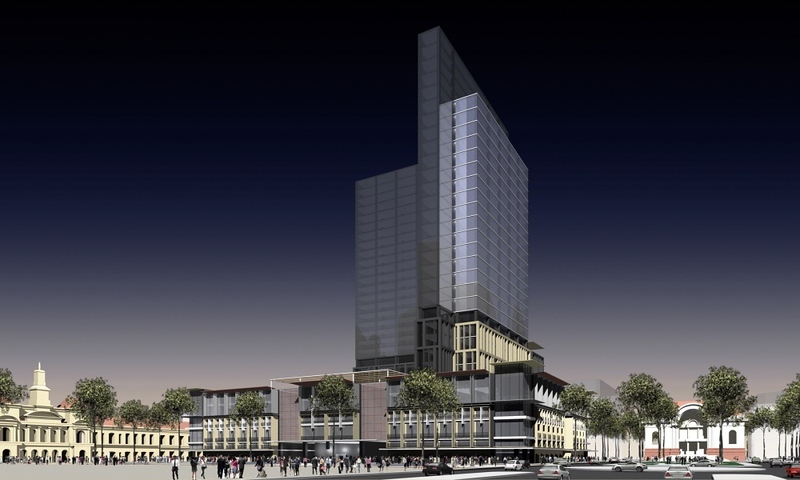 The Majestic Hotel extension is another project in the stalled list, with the only thing to show for it being an empty lot next to the original building. This design was from 2011 which was later updated. 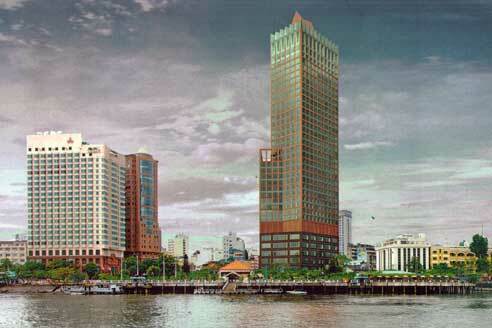 Address: 125 Hai Ba Trung, District 1, HCMC. I’ve listed this under “never built” mainly out of wishful thinking, as I don’t know what the status is of this one. Projects can remain dormant for years and then suddenly spring to life. This building is a proposed new office for the postal service, behind the main post office. 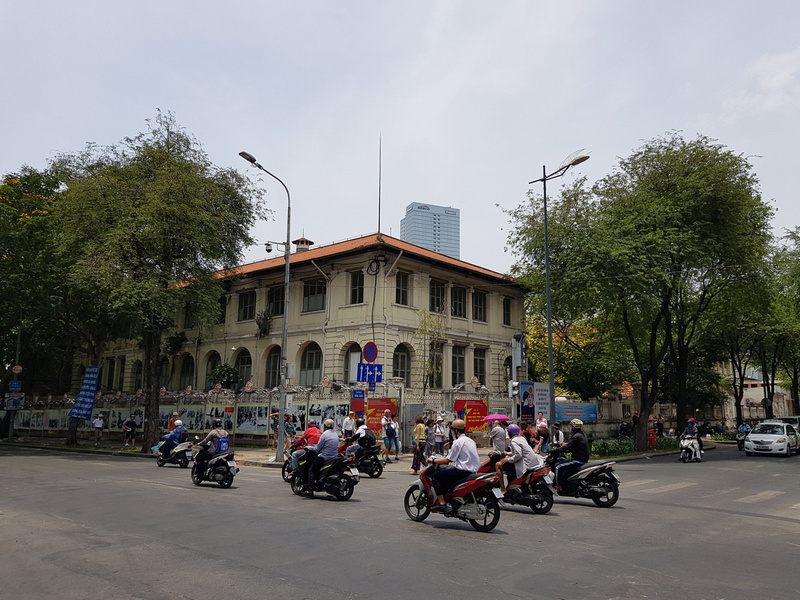 It would replace an old brick building full of character on the corner of Hai Ba Trung and Nguyen Van Binh (the book street). Address: 2-4-6 Hai Ba Trung, District 1. This project was originally announced in 2008 as the Sabeco World Trade Center, named after the beverage company located on the site. 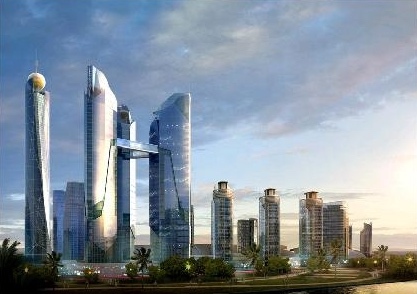 The original design featured three cylindrical towers of varying heights. It was later updated to a sleeker tower to fit into the triangular shape of the block of land. 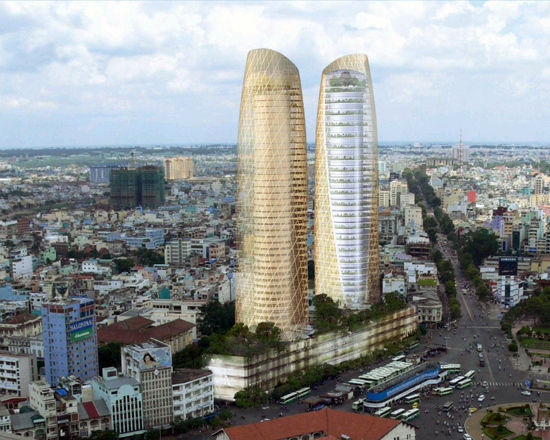 The current proposed Me Linh Tower is sitting in the stalled projects section. 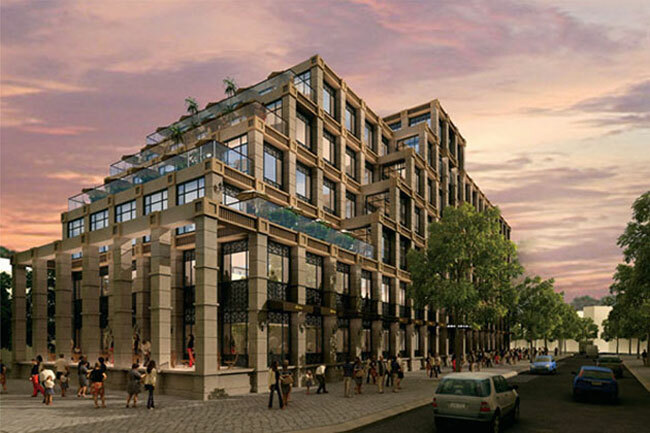 It’s been unofficially reported that the property has been sold to another developer, so the last render (below) might also become a never built if the new owner has a different plan. Address: 32 Ham Nghi, District 1, HCMC. 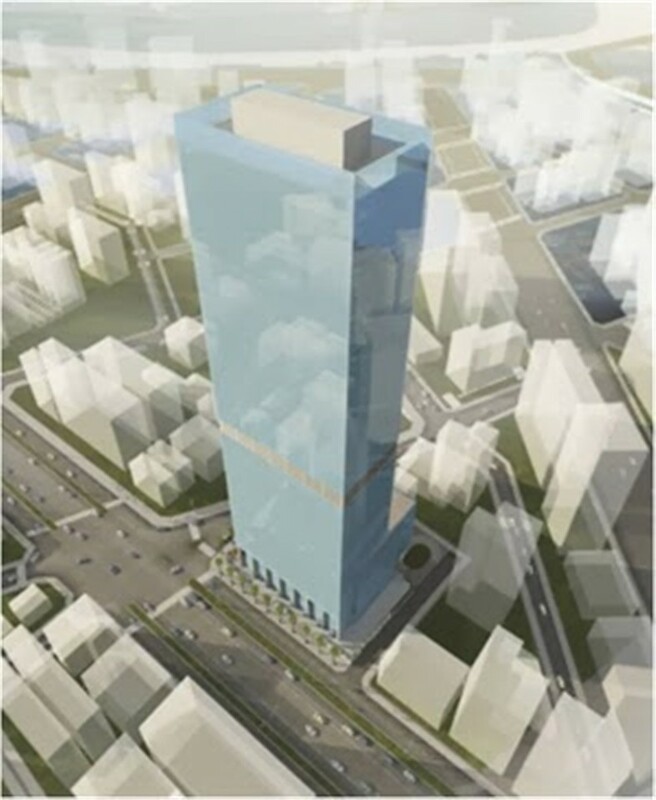 One that I hope remains in the never built category is the plan to put a tower on top of the colonial-era office at 32 Ham Nghi. This concept video from 2012 shows what it might have looked like. Putting aside the objection to desecrating a heritage building, I wonder if having a curved window face opposite the Bitexco Tower is wise. It reminds me of the “walkie talkie” skyscraper in London, where the curved glass melted cars on the road. Address: Thu Thiem, District 2, HCMC. 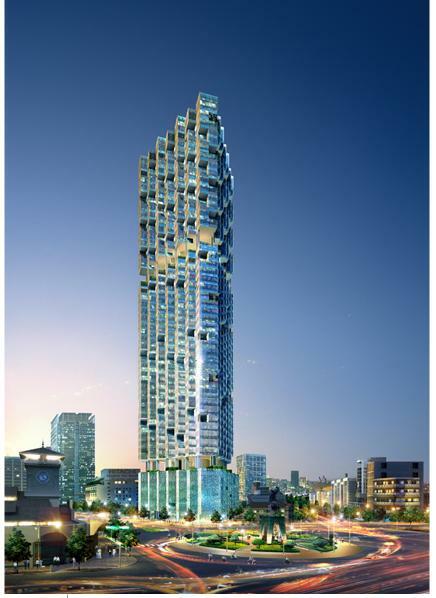 The Thu Thiem New Urban Area is the showcase redevelopment area of Ho Chi Minh City, and over the years numerous designs for an observation tower have been offered as the architectural centrepiece. The Thu Thiem area hasn’t been finalised yet so it may end up with a tower at some point. 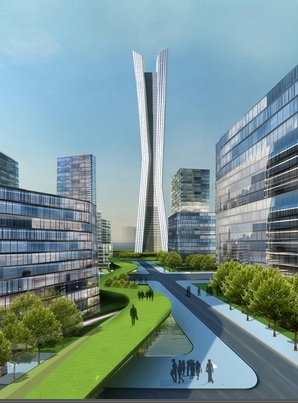 What a tower might look like with a completed new urban area city. 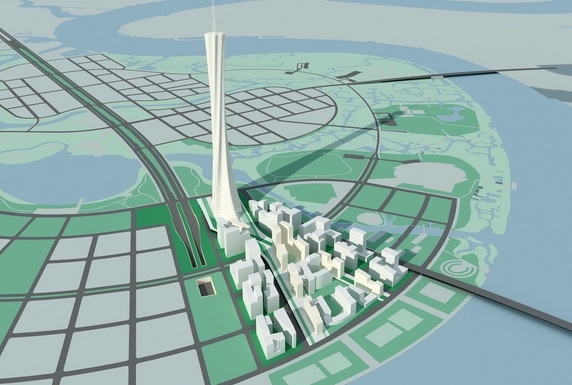 And the tower on the map in relation to the Thu Thiem New Urban Area master plan. 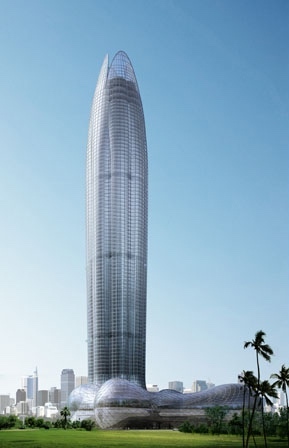 At 450 metres and 105 floors this was one of the biggest proposals that never was. 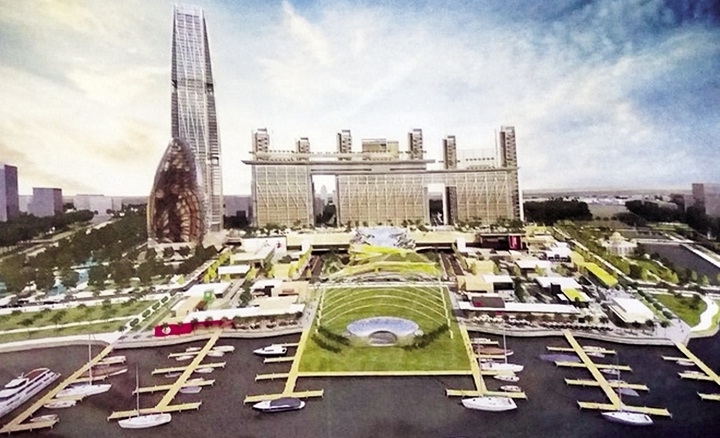 Here is another never built project in Thu Thiem, which you might have picked up is a recurring theme of the area. 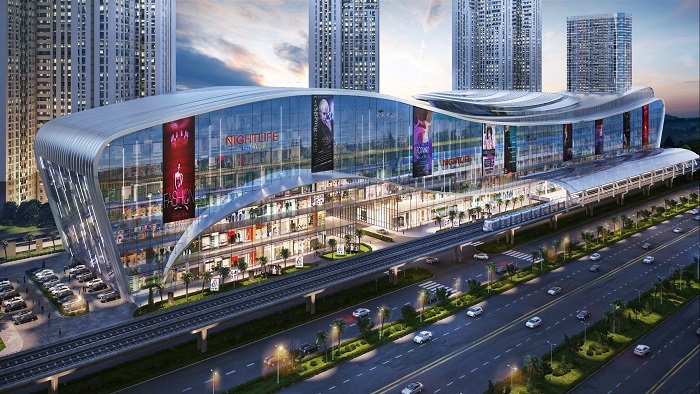 The Financial Convention Center in the Thu Thiem New Urban Development Area was a short-lived proposal in 2016. 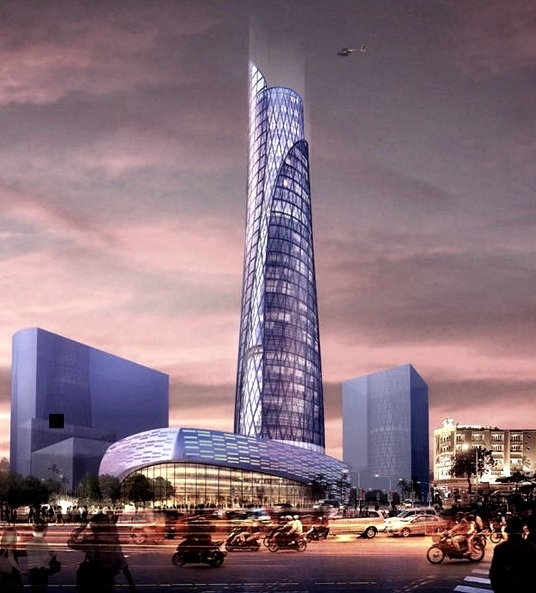 This was a $4 billion project proposed by Steelman Partners, Cantor Fitzgerald, and Weidner Resorts, along with Vietnamese company Imex Pan-Pacific Co. Ltd. (IPP). 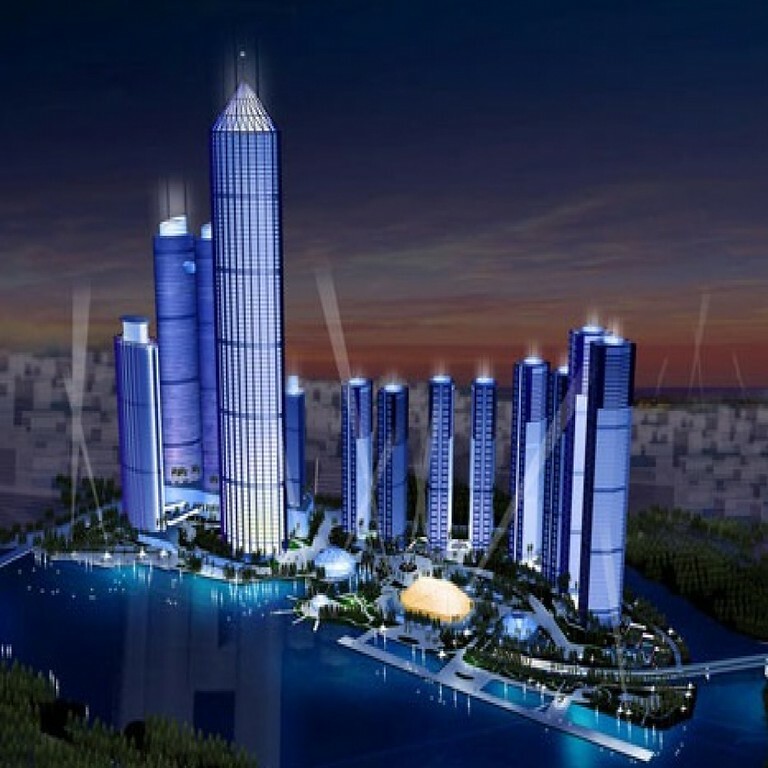 The plan included a 70-floor tower along with a resort, entertainment, offices, and a shopping mall. 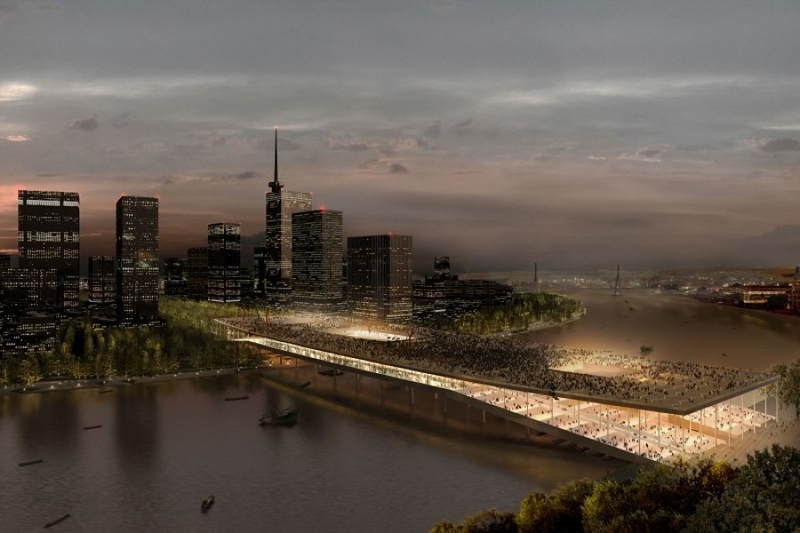 Various designs for a pedestrian bridge connecting District 1 to District 2 have been proposed over the years. This one was second place in a design competition in 2008. There is still no official bridge design yet, so expect to see a few more designs added to the “Never Built” category. 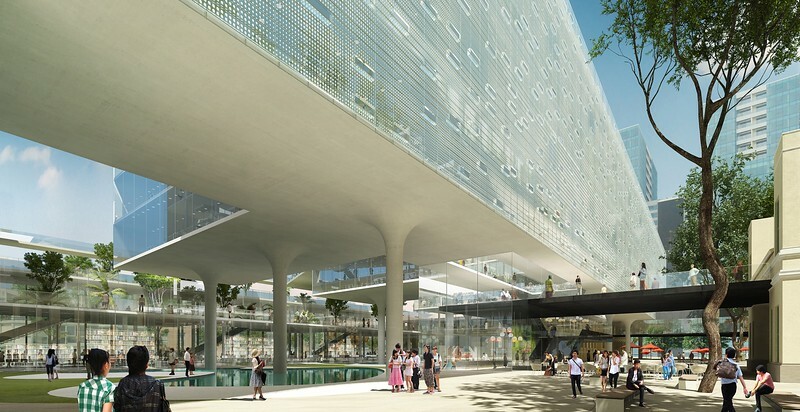 This version of the Thu Thiem Central Square from 2008 looks nothing like what the area is now projected to look like. Address: Corner Mac Dinh Chi and Nguyen Dinh Chieu, District 1, HCMC. The site of the proposed office tower for Asia Commercial Bank was an empty lot for years, and is now a two-storey office block. Location: Thanh Thai/To Hien Thanh/Dong Nai/Bac Hai, District 10, HCMC. 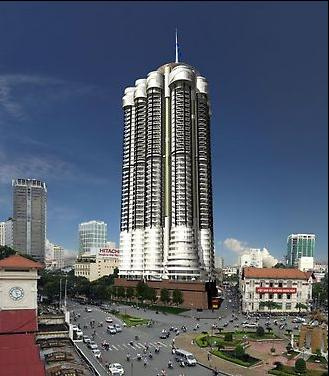 Thien Thanh Sai Gon Plaza would have been a city within a city block, and making it a landmark of District 10. This project remained dormant for years, and has now been replaced by Kingdom 101, which is a less ambitious apartment development. An older version of this project had two towers on a retail podium. This is listed as “never built”, but I wouldn’t consider this project as being dead and buried yet. 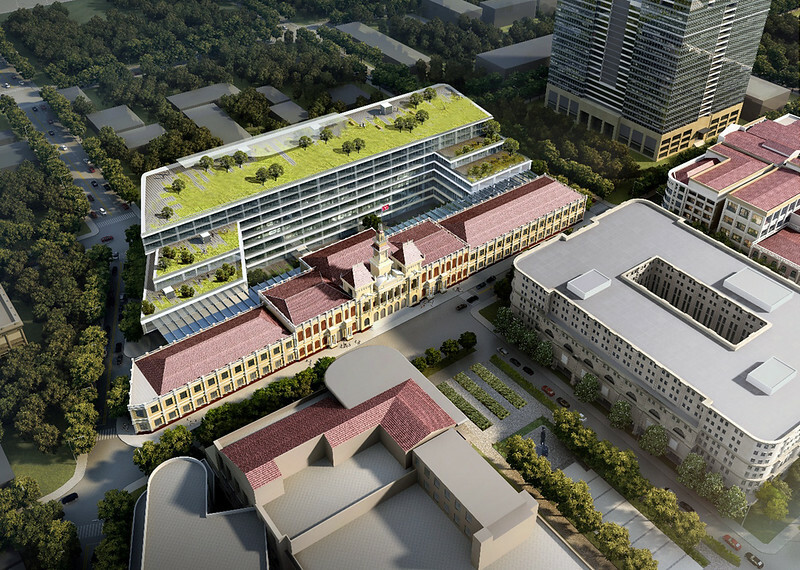 There have been several concept designs to add an extension behind the historic city hall building. The extension would be built at the expense of existing heritage buildings. Some of these design concept look world-class, and they would make a great addition to the architectural variety to the city. They should be doing this in District 2 where there is open space, rather than threatening to demolish heritage buildings. 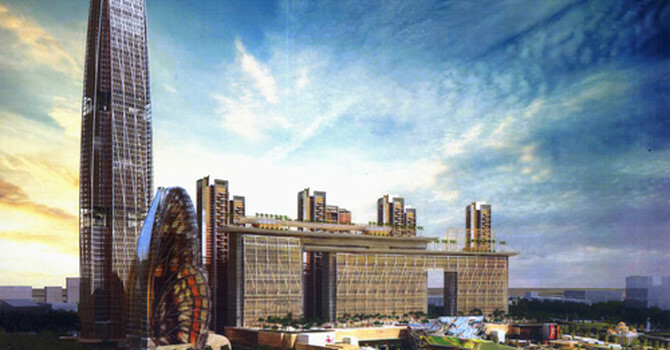 This one is not so much “never built” as “never implemented”. 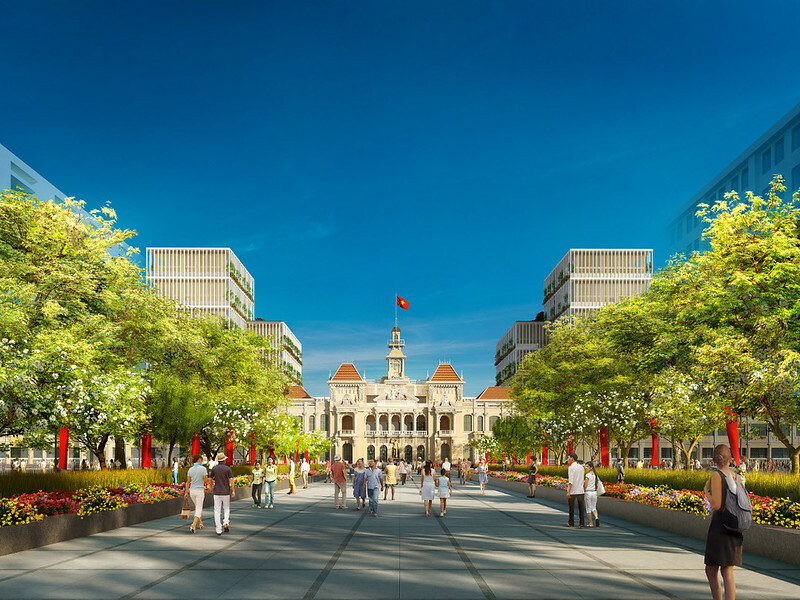 In 2010 a study was commissioned for the preservation and improvement of Cholon – the historic Chinatown area of old Saigon. The study was funded by the Government of Spain for the Department of Planning and Architecture (DPA) of the People’s Committee. You don’t need a consultant to tell you that preserving old shophouses is going to be a win for the city (give me an email next time, and I’ll tell you that for free). 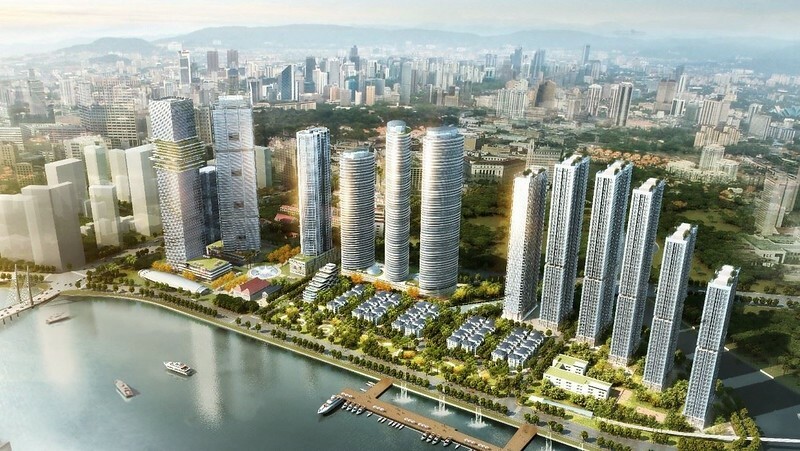 Take a weekend trip to Singapore or Penang, and you will soon see that these buildings are architectural jewels that draw in tourists from around the world. Since this study has been released Cholon has been losing heritage buildings at a steady rate, making this proposal harder to implement. 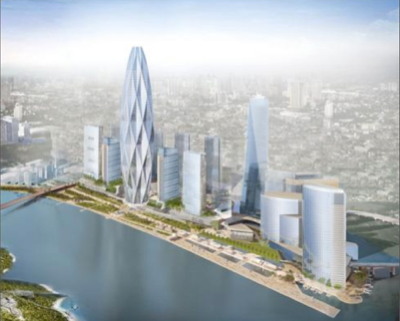 Images and details of the study can be found at Cholon: A key area for the bright future of Ho Chi Minh City. 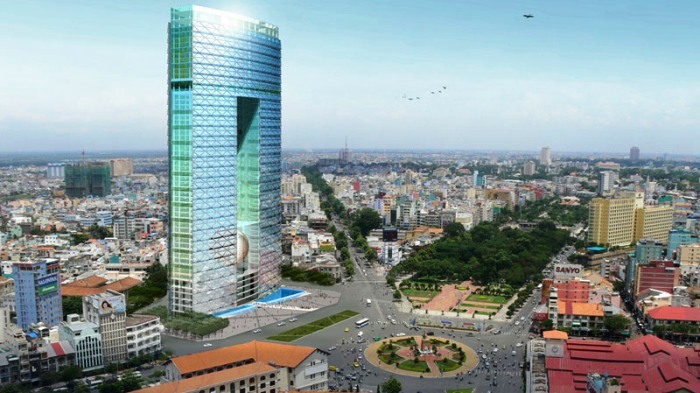 This 400+ metre tower was planned to be built at the corner of Nguyen Huu Canh and Dien Bien Phu Streets in Binh Thanh District. It was first announced in 2008, and then it was scaled back in size while the start was delayed. 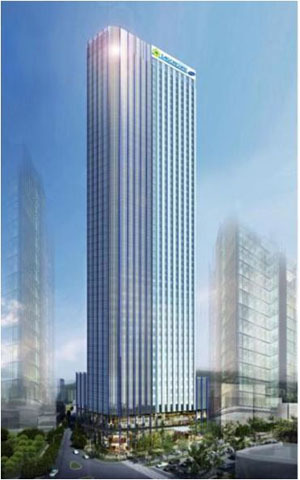 Eventually nothing came of this, and the site is now a part of the Landmark 81 Central Park area. 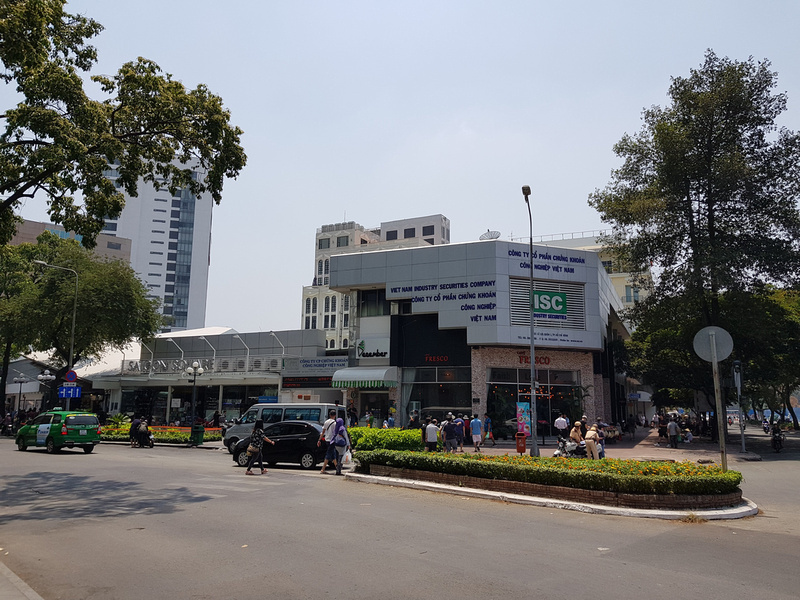 Location: Nguyen Hue – Ngo Duc Ke – Ho Tung Mau – Huynh Thuc Khang, District 1, HCMC. This project came out of left field, and if it wasn’t on an established developers website I would have thought it was a fantasy render. 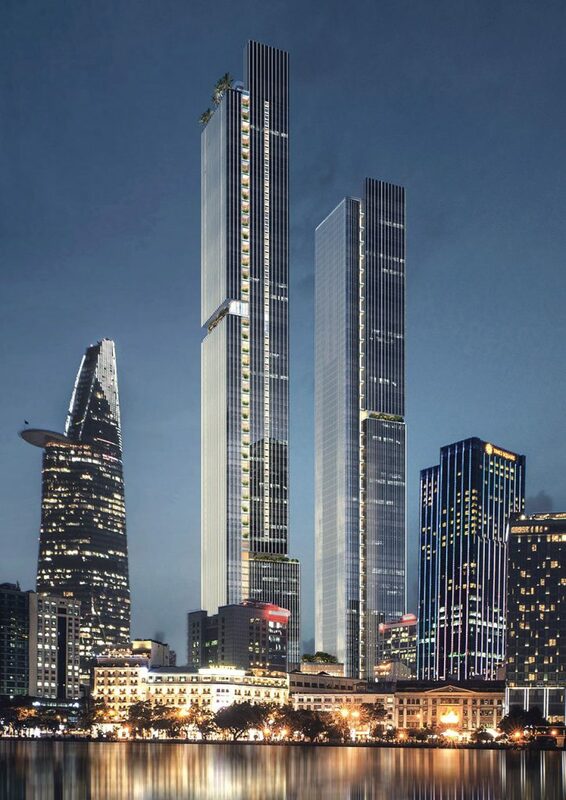 This two-tower project soaring at 90-storeys would require clearing an entire city block in the middle of the city. It’s the sort of project that you would expect in Thu Thiem, where there is space available. Address: Corner Nguyen Trung Truc and Ly Tu Trong, District 1, HCMC. 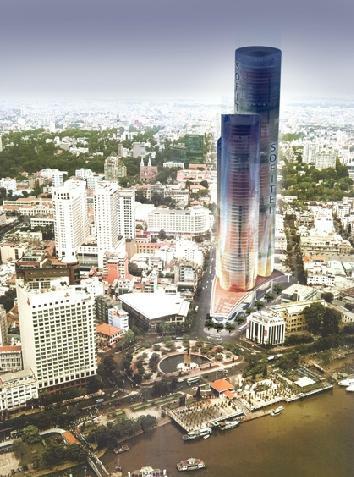 This proposal next to the General Science Library of Ho Chi Minh City was never built. Instead the former building was gutted out and remodelled, and now currently sits in a half-finished state.